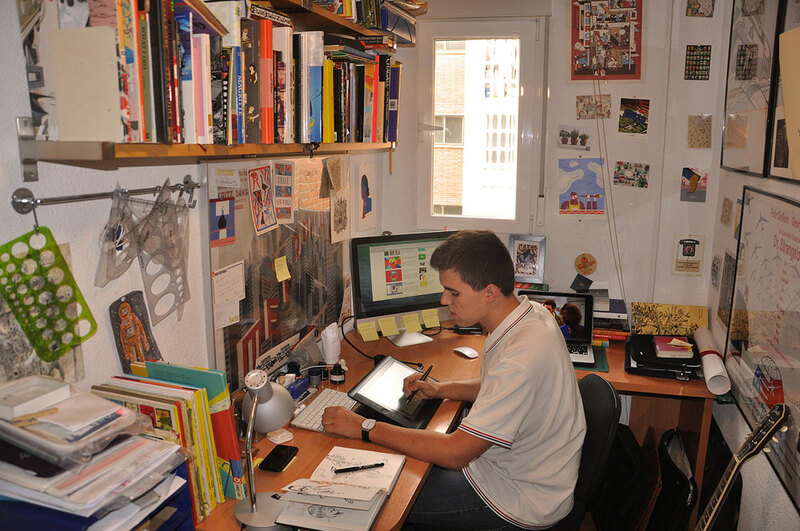 Andrés Lozano is one busy creative! Having just completed his Masters in Illustration, he’s also been working as a freelance illustrator and Art Director for Walk with Me studio. Always looking to collaborate with people from around the world, Andrés is ready to embrace the projects ahead. Drawing inspiration from nature, architecture, Franco-Belgian comics and film noir, your illustrations sit in a wonderful world of their own. What five words would you choose to describe your illustration style? Pick three things that are most valuable to you in your working studio in Madrid and explain to us why you have chosen those and what story there is behind them. I work in Madrid because that’s where I was born and where I’ve lived my whole life. I’m quite young and just finishing my university degree so I haven’t been able to live in different places. Next year I’ll be moving to London and I’m looking forward living and working in such a dynamic city. Having said this Madrid is a beautiful city to live in, great climate and food and not as expensive as other European capitals. There’s also a small creative community of designers and illustrators. First of all, I go to my website to see what I’ve made previously in order not to repeat myself. I then look for references of similar works online and browse through my favorite blogs and books to get inspired. Even though I work digitally I always need to start sketching on paper. I keep many sketchbooks so I choose one and start making thumbnails of different ideas and compositions. When I find one that I like I start working on it digitally. I think it’s not so much about strength than impact. A strong illustration can draw attention immediately and make you look in a way that words seldom achieve. Notwithstanding both illustrations and words try to tell a story, to communicate something, and that message is what ultimately has to be strong. ‘Guts’ was founded through a group of 11 students from Madrid University, which of course includes you. How did the idea come about and what is the main intention of the zine? We were all a little bit tired of what we were doing in University. It was a way of doing something cool together that involved illustration. We started making the zine about a year ago and we have just released our 5th issue. Each issue of Guts has a topic, a format and three colours. The rest is up to each illustrator. It’s a great way of doing personal work and trying new things. Also our launching parties are epic. The power of sharing through social media is all around us and constantly growing. How has the power of sharing had an effect on your work, either for the positive or negative? I think that the internet and social media are nothing but great gifts for illustrators, designers and artists. Being able to reach so many people and potential clients from all around the world is something fantastic. Of course it may have affect your work and take you some time from creating, but I think complaining about that is a little bit absurd, as being able to share your work so easily is worth spending a few minutes everyday updating your work or your Instagram account. I love watching sitcoms while working. Well not exactly watching but listening and peeking at the screen from time to time. Last year I watched “Seinfeld’s” 9 seasons while working. That’s how hard I work.